From 2 weddings to the surprise sangeet performance and the Amsterdam Bachelorette here’s everything you don't know about Priyanka Chopra and Nick Jonas’ wedding! Priyanka Chopra and Nick Jonas are to get hitched on 2nd December Jodhpur but it seems that the run up to the big day has begun in earnest. While I was just recovering from the super-cute and stunning bridal shower PC’s friends threw for her in New York last week, it looks like there is another pre-wedding function coming up. It’s the desi girls bachelorette!! PC shared a flower-filled picture with ‘Bachelorette Vibes’ written on it as part of her story, with pale pink and golden balloons surrounded by pink and white roses! And that def meant that her bachelorette party was in full swing. Looking at the sunkissed picture of the bride-to-be, moments before her party kicked-off on a yacht, it surely seems that she had one gala time there! P.S., that bling is blinding girl! 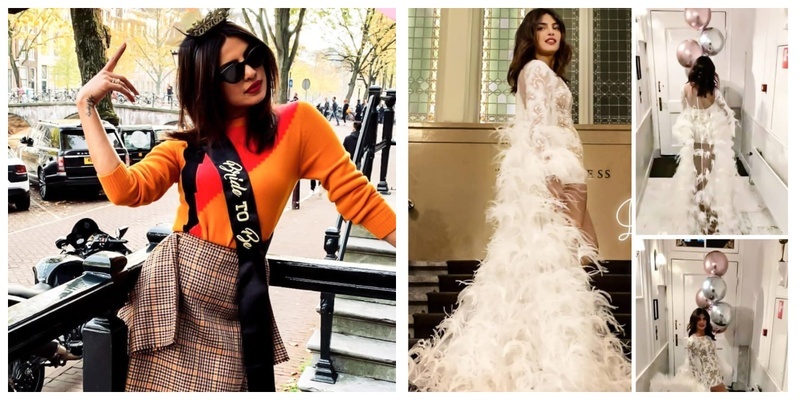 The soon-to-be sister-in-laws Priyanka Chopra and Sophie Turner bonded during the bachelorette celebration in Amsterdam as PC gave Turner a piggyback ride in high heels! The traditional Hindu ceremony is rumoured to take place in Jodhpur on December 2, and a Christian wedding will follow on its heels. The celebrations will be held at Umaid Bhawan Palace Hotel in Jodhpur, and 1500-2000 guests will attend the functions. Reports suggest that the couple has roped in a few popular Bollywood singers who are all set to perform at the star-studded sangeet. But it gets better than that. It seems the groom-to-be is going to put up a 45-minute performance at the event and I literally can’t keep calm! “Nick will be performing with his troupe at the sangeet. It is tentatively a 45-minute performance where he will be singing some love songs for Priyanka. The event organisers have already been told about this special act that will be a part of their sangeet,” said a source. Can’t wait wont wait for this big-fat Royal Wedding!